Possibly worse than finding no morels at all is finding the freshly trimmed base of a stipe, a little white circle in the dirt that indicates someone else beat you to your goal. Competition is the bane of the morel hunter, and with popularity of the pastime increasing the odds of filling a bag each spring is decreasing. 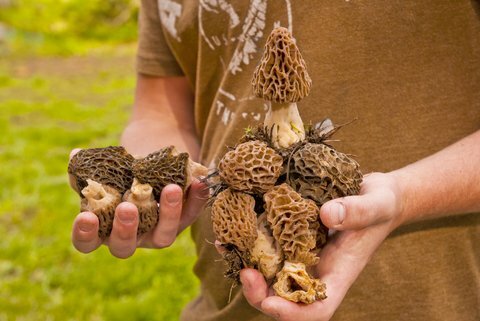 For the inexperienced hunter, the actual web of fact, folklore, and personal experience that contributes to locating morels is a complex one. It is important to employ strategy and etiquette in conjunction with the hunt in order to keep your public spots off the radar of others and in ideal shape for your own future use. Once your secret spot is exposed to one other person, consider it surrendered to the legions of searchers who want your prize. If you have drab colors and camouflage, wear them. Assuming there may be other people in the vicinity of the area you are hunting, why draw attention to yourself when you can slip below the radar? Possibly most importantly, always keep a knife on you and always cut mushrooms at the base because ripping mushrooms from the ground upsets their mycelium, which is the core of the organism, the underground web that remains from year to year and bears the fruit that is the mushroom. Very early mushroom hunting seems to be best because low light makes spotting a morel easier than when dealing with overhead sun interfering with vision and casting shadows. Also, far less people will be out and about on trails in the early morning hours. You don’t have to take everything you see, but also don’t leave mushrooms expecting to come back when they’re bigger. You will all too often return expecting to find a bigger mushroom than a few days before, but instead will find a mushroom that didn’t grow more and dried up, was eaten by animals, or worse, harvested by someone else. On the vast burn sites of the West, where morels can be forecasted each year, swarms of commercial hunters descend on the same ground to make money. In decades past this has ended in bloodshed on multiple occasions with ethnic tensions between Americans and Southeast Asians contributing to the violence. Luckily, more peaceful avenues of competition are present among recreational hunters. In the instance that two people run into each other in the same area, it is best and most polite to just go your separate ways and not spend too much time on top of each other. In the more complicated situation in which morels are present, you don’t have to surrender your success on public land, just give space so that each person can spot and pick their own mushrooms without the awkwardness of “calling” the same mushroom at the same time. For those interested in picking morels on public land, it is important to remember that it is illegal to take anything from dedicated forest preserves, including mushrooms. State parks and local parks, however, are perfectly pickable areas, just do research beforehand to know if there are any bag limits.